Who would have thought, the new guy had some bad intentions. Another backyard drama. This time I have dusted off my coal set to prevent it from running out of warranty. I love your illustrations and your wonderful sense of humor. Will be visiting this site often! No bad intentions...he just wants to fit in with his new friends...or fit his new friends in? these eyes are just great :) are the poor chickens intended to have different expressions? What a great bunch of fluffy critters! Very neat style. I know the fox has an evil look to him but I'm going to pretend they are all pals and going to live happily ever after. Very clever illustration. The dry media works very well. The drama is almost too much to bear! And look at that up-lighting! Wow! -did I mention the color? Look at all that color!! Let's see MORE of this style! Jól áll ez a stílus. :) És az ötlet is szuper. This is so cute and funny, love it! Great illustration! Wonderful humor! 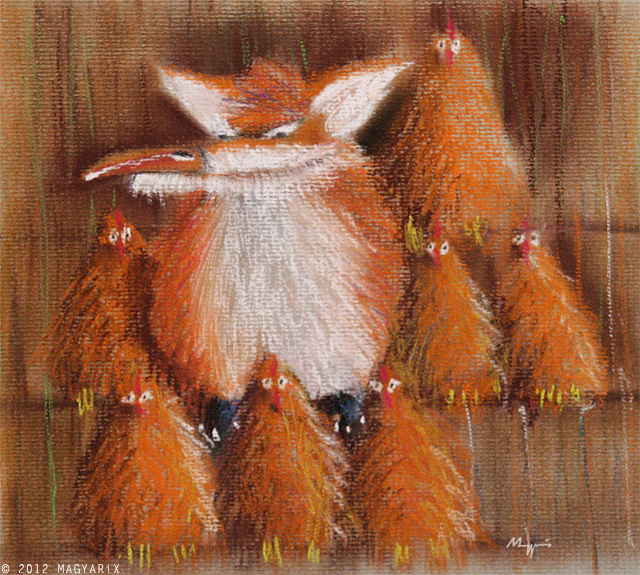 The expression is obvious on the fox, but especially love the vacant looks of the chickens! Thanks for your inspiring comments!